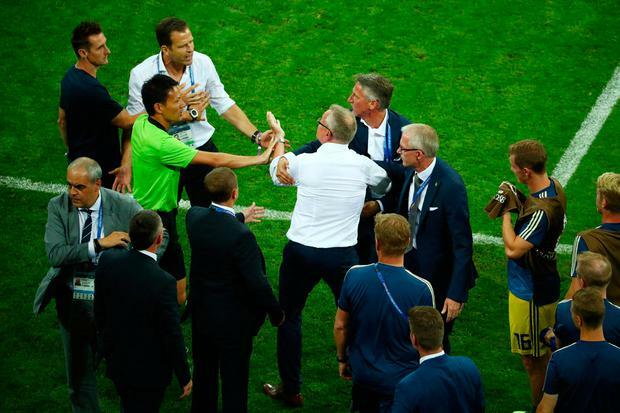 Sweden coach Janne Andersson hit out at the German bench for "rubbing it in" as they celebrated Toni Kroos’s stoppage-time winner in Germany’s 2-1 World Cup Group F victory on Saturday. "Some of the German leaders of the team celebrated by running in our direction and rubbing into our faces by making gestures and that really got me annoyed and angry," said the Sweden coach whose team had led 1-0. "There were many people on our bench that were annoyed. We fought it out for 95 minutes and when the final whistle goes you shake hands and leave. So I was very angry," he said. "All I am saying is people behaved in ways you don’t, you cheer when you win, you leave the opponents to feel sad, you don’t react in the way they did." Germany coach Joachim Loew said he was not aware of any taunting. "Who made gestures, did I make a gesture? I didn’t witness that because after the final whistle we were concentrating on other things. We fell into each other’s arms and were so elated. I didn’t see any aggressive gestures," he said. Sweden and Germany are both on three points with leaders Mexico on six heading into the final group games meaning there is all to play for — including, mathematically, for bottom team South Korea who are without a point. Victory for Sweden against Mexico would secure their place in the knockout stage. "We still have an excellent opportunity to qualify and we will do everything to achieve that," Andersson said. "Emotionally right now we are so disappointed. We are going to clean up, catch up and we have every chance of qualifying on Wednesday for the knockout stage," he added. "There are so many feelings right now, this is probably the heaviest conclusion to a game that I have ever experienced in my career. "But the whole group is still alive so we have to lick our wounds and come back from the next one," said the Sweden coach.